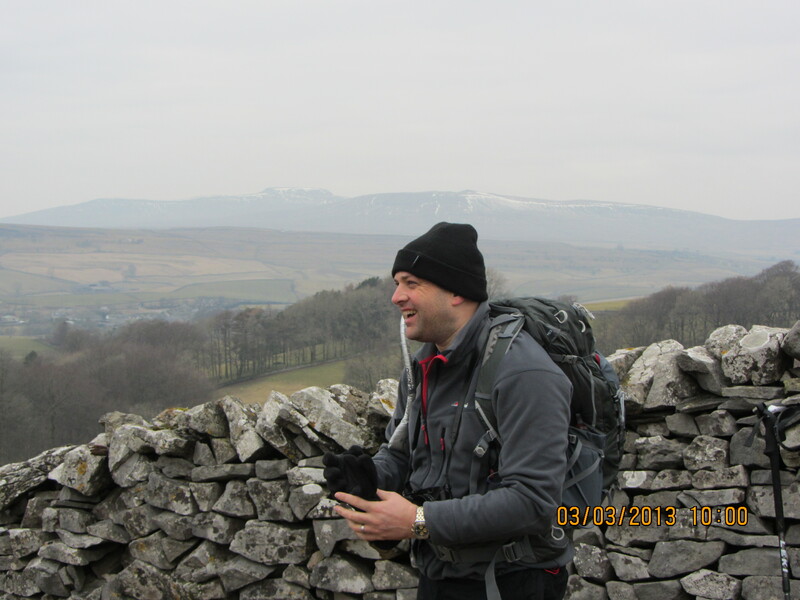 Jeff and I just got back from hiking up Pen-y-ghent in the Yorkshire Dales National Park. It’s one of the peaks from the “Yorkshire 3 peaks challenge”. Just a two man team today as Paul and Debbie couldn’t make it as they’re on honeymoon in the Caribbean (good enough excuse I suppose) – congratulations to them both! All four of us will be doing Pen-y-ghent on the 20th of April as a night hike. This is to help up get used to our night gear, in my case my Petzll Tikka Plus 2 head torch. We’ll be doing the final ascent of Kili at night so it makes sense to have a practice at handing ourselves whilst walking in the dark. It was a relatively short hike at < 7 miles but we worked hard on the first half as we ascended up the fell’s “steep” side as you can see from the climb stats. Conditions were overcast, still and pretty cold to start but the work rate of getting up the southern slope soon had us loosing layers as we warmed up. I took a totally loaded up pack with all the daytime gear I’d expect to have on Kili +3 Litres of fluids. Overkill for what this day walk demanded but good training – no point lightening the load only to try to carry more on Kili. In fact I might try to overload my bag for UK training walks so my Kili pack is lighter – train hard, fight easy and all that…. I took my Fuji X10 camera out on the walk. Martine bought me this for Christmas after researching suitable cameras for my Kilimanjaro climb. It’s compact but with a great lens (wide angle –> tele-photo zoom) and in the right hands can take some nice shots. I’m by no means camera savvy so I’ve been playing with some of its extensive features, settings and modes. I’ve posted a photo album from the day on my Kilimanjaro facebook page. Post walk celebrations were a mug of tea and toasted tea cake in the Pen-y-ghent café before the 70 mile drive home. Categories: Gear, Training | Permalink.